There are few more heartening sights to encourage us through the last few weeks of winter than that of a clump of hellebores in flower. Battered by wind, beaten down by snow and rain and frozen by frosts, they still come up bursting with energy and full of flowers. They should be prescribed by doctors for people suffering from winter blues. Until a decade ago winter-flowering hellebores were called Helleborus orientalis but there has been so much breeding and cross-pollination of plants that they are now grouped under the generic name of Helleborus x hybridus. Its not just the name that has changed. During the 1950s and 1960s when the garden-writer Margery Fish was championing hellebores, and H orientalis in particular, as indispensable year-round plants, she had a limited range of plants to choose from. The flowers, which were all the same size and shape, were always a shade of pink or muddy-purple. Occasionally one could find plants with cream-coloured flowers but these were rare (and expensive). Since then nurserymen and plant breeders have cross-bred their best hellebores with species collected from the wild to produce flowers in colours and shapes that Mrs Fish could probably not have imagined. Yellow and apricot flowers complement dark plum and slate-grey ones. Some flowers have speckling on their petals and others have petals that are edged in red. The shape of the flowers is also changing with star-like flowers that have narrow, sometimes twisted, petals wile other breeders have concentrated on producing more rounded flowers. Most astonishing of all are the frilly, double-flowered forms that are a long way from the demure simplicity of the original plants. All of these plants are grown from seed after careful hand-pollination with paintbrushes. Producing plants with flowers as exquisite as these cannot be left to something as random as a bumblebee. Because they are grown from seed hellebores from the same parent can have slight variations so buy yours when they are flowering. Its only by seeing them in flower that you can be sure of getting exactly the right shape of flower and shade of colour that you want. The best-selling hellebores at the moment have flowers that are so dark they are almost black. These are very seductive when they are on the sales tables at the nursery garden centre but once planted in the garden they can become lost. Planting them among drifts of snowdrops or against silver foliage plants, such as one of the silver-leaved Brunnera, helps them to stand out. 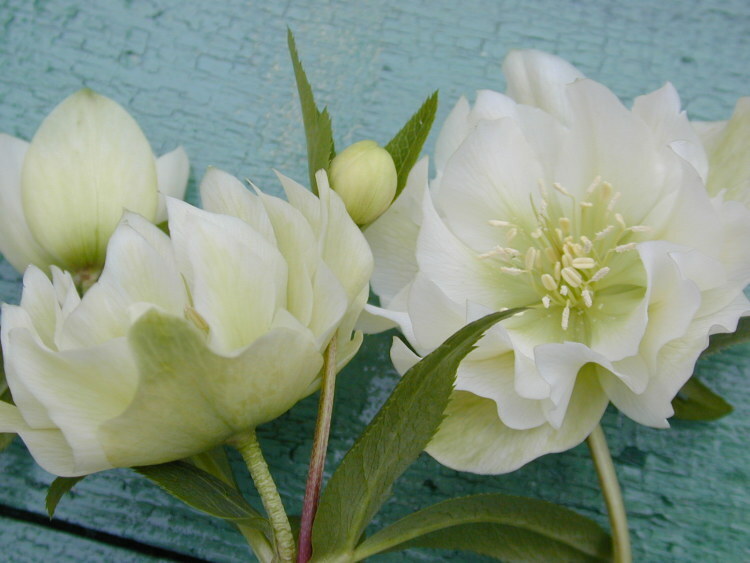 If you want hellebores that will catch the eye from the comfort of a warm kitchen, plant the white-flowered forms. With such a range of colours already available breeders seem to be focusing on the shape of the flowers and the growing-habit of the plant. Elegant ‘anemone-centred’ forms have been introduced which have a ruff of small petals in the centre of the flower. One bright spark thought that they would try and breed upward-facing hellebores. Fortunately it didn’t work. Part of the joy of growing the plant is having to reaching down to turning the flower towards you to look more closely at it. 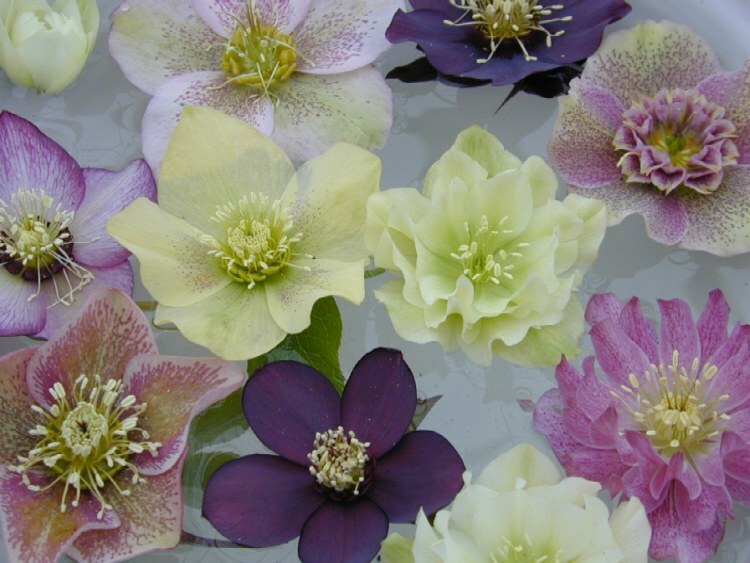 As well as the hellebore hybrids there are many species hellebores that are worth growing. Helleborus niger. This is the classic Chrstmas rose, with large sparkling-white flowers. I don’t know how the plant came by its common name because I’ve never had one in flower at Christmas. But then, like many gardeners, I don’t have a lot of success in growing them well. It is a temperamental plant that needs perfect growing conditions to thrive. If you can give it a place in dappled shade and humus-rich soil that doesn’t dry out then you should be able to grow glorious plants; the rest of us will struggle to even keep the alive. Helleborus foetidus. This is a British native that has large dark-green leaves and sprays of apple-green tight bells in early spring. You see it growing on roadside verges and in deep woodland. In the garden it will grow anywhere that is not waterlogged. Its not as flamboyant as some hybrids but it does have a lot of charm. 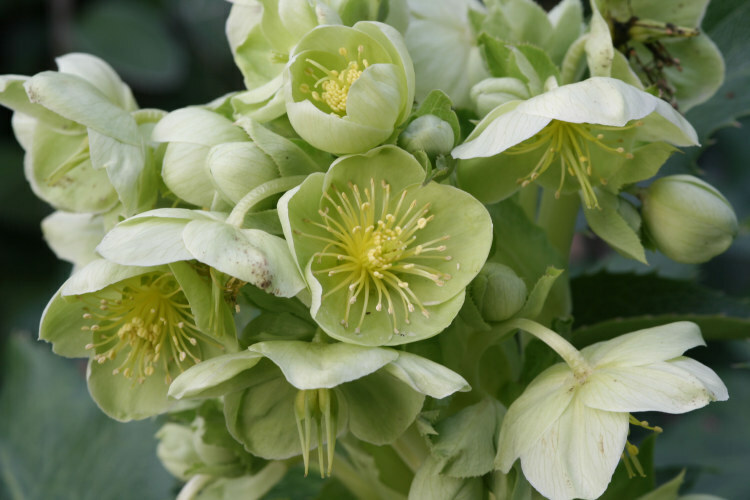 Helleborus x hybridus are accommodating plants that will grow in both light, sandy soils and heavy, clay soils, as long as plenty of organic matter is dug into the soil before planting. All hellebores are hungry plants and and will flower best if they are given an annual mulch of compost or well-rotted manure in the autumn. In then wild they grow under the canopy of deciduous trees and shrubs and this is the ideal place for them in the garden. Although they will tolerate sunny situations they grow best in situations that are shaded from midday sun. Avoid deep shade, though, as this will inhibit the plants from flowering. Helleborus x hybridus are evergreen but their leaves do die back and should be removed. Only remove dying and diseased leaves so that plants can benefit from maximum photosynthesis. However, when the plants are in flower I do remove any healthy leaves that are covering buds and flowers. This is not just so that I can see the blooms; it allows light and air into the centre of the plant. Hellebores produce masses of seedlings. Weed-out any that seed themselves into the crown of the parent plant, otherwise they may smother it.